Reliance Jio recently introduced new prepaid plans and upgraded most of its existing prepaid recharge plans. 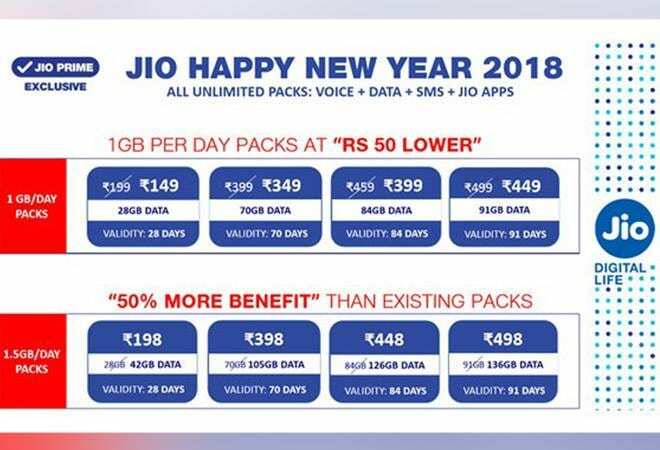 Jio’s new and revised prepaid plans come under Jio’s ‘Happy New Year 2018’ offer on 9th January. Jio’s new prepaid recharge plans are below. These 1 GB per day prepaid recharge plans will either offer more data or get a price cut of Rupees 50. Rupees 198, 398, 448 and 498 recharge plans currently offer 1GB of data per day, but after the revision, it will offer 50 percent more data or 1.5GB of data daily at the same price. All these prepaid recharge plans will be only available to Jio Prime members only.